View, create, and edit your co-worker's appointments and contacts just as you do with your own - all from within your copy of Microsoft Outlook 2000, 2002, 2003, 2007, 2010, 2013 and 2016. Control who can see and/or do what with comprehensive Outlook calendar sharing security. 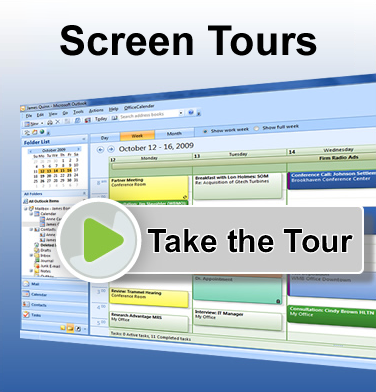 OfficeCalendar's interactive Outlook group calendars make group scheduling easy. Exchange Server and PhD not required! No need to purchase new hardware and hire expensive experts with our low cost alternative to Microsoft Exchange Server. Unlike other solutions for sharing Outlook and syncing Outlook with mobile devices; OfficeCalendar doesn’t create a confusing new set of folders in Outlook and force you to move the data in folders you’ve been using for years. OfficeCalendar works seamlessly inside your copy of Microsoft Outlook 2000, 2002(XP), 2003, 2007, 2010, 2013 and 2016; and does so using your existing Outlook folder structure. OfficeCalendar Online allows you to access your personal and shared Outlook data Online via a web browser using a PC or Mac based computer. OfficeCalendar Online provides the functionality to view add and/or modify your personal and shared Outlook calendar, contact and task folders via the web, from anywhere at any time. OfficeCalendar Mobile enables wireless (over-the-air) syncing of your personal and shared Outlook calendar and contact folders to your iPhone, Android and BlackBerry phones. OfficeCalendar Mobile allows you to access personal and shared Outlook calendars and contacts right from your mobile device. OfficeCalendar also offers powerful group calendaring and scheduling capabilities that even Microsoft Exchange Server doesn’t offer. With OfficeCalendar, administrators can create and name multiple group calendars, select the users/resources that are displayed in the associated group calendar(s), and assign who the group calendar(s) will be visible to. Do you have Microsoft Outlook and need to share calendars with your colleagues, but don't want to spend a fortune on software, hardware, and experts required for Exchange Server? Then OfficeCalendar is the solution you've been searching for. OfficeCalendar is a simple software application that lets you share Outlook calendar, email and contacts with your colleagues; create interactive group calendars for group scheduling; and more. OfficeCalendar is easy to install and use, and is very affordable. Best of all, if you already know how to use Microsoft Outlook there's nothing new to learn. Pricing starts at just $99 per user with quantity discounts when 5 or more user licenses are purchased.